By appointment. Can be at office, showing of property, or listing property. Hella Rothwell, broker/owner/REALTOR of Rothwell Realty Inc. with offices in downtown Carmel, has listed and sold a spectrum of real estate from oceanfront homes to income properties since 2006. She has been lauded by her clients for her personalized style of service. Hella is also a licensed real estate broker in the State of Hawaii. A stakeholder in Carmel-by-the-Sea since 1995, Hella is the organizer of the acclaimed annual Carmel Art Festival, the non-profit ''historic'' plein air event now in its 25th year. Ocean Ave and Dolores. 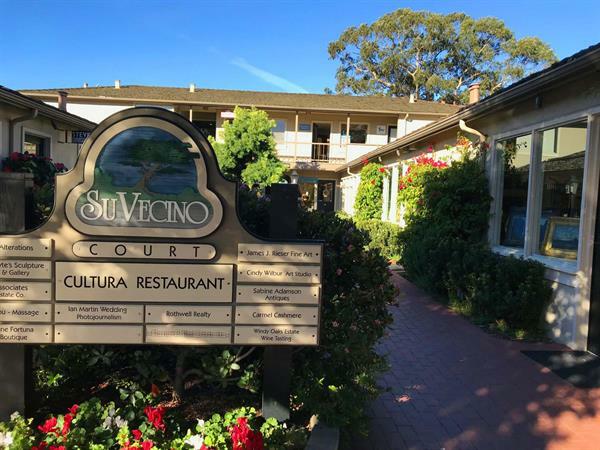 Go north about mid-block on west side to Su Vecino Courtyard on Dolores between 5th & 6th in Carmel-by-the-Sea. Offices on 2nd level.